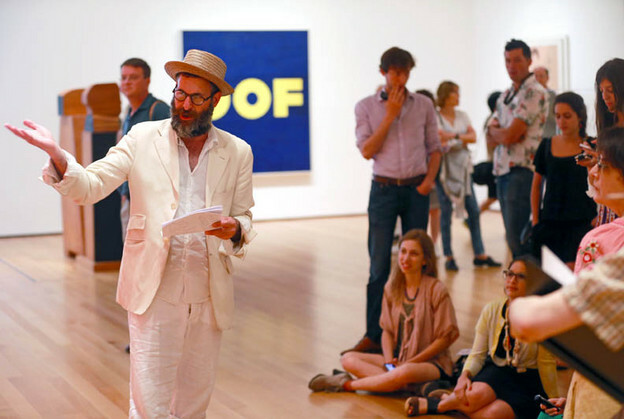 Above: a photograph by Lawrence Schwartzwald of Kenneth Goldsmith in his final appearance as Poet Laureate at MoMA yesterday, reading from Seven American Deaths and Disasters in front of (and here gesturing toward) Andy Warhol’s Orange Car Crash Fourteen Times. (Photo cannot be reproduced without permission from the photographer.) On March 20, 2013, Goldsmith gave his "poet laureate lecture," titled “My Career in Poetry, or How I Learned to Stop Worrying and Love the Institution”; this was recorded and is available as a video here. Seven Deaths was recently reviewed by Dwight Garner in the New York Times.